I’ve mentioned in my previous posts that we have been actively recruiting team members to join us as we serve in the Chula Vista area. The Lord has answered that prayer in bringing Ray and Michele Call to minister with us. They were serving with MTW in Mexicali, but the Lord closed some doors there, and opened doors for them to work with us. It is indeed, a new call for the Calls, and we are excited about it! Ray and Michele grew up in Orange County in Southern California. After they graduated from college they were involved in an evangelism and discipleship ministry with Campus Crusade for Christ. They were ministering at Fresno State, my alma mater. While they lived in Fresno they got to know Sierra View Presbyterian Church. Sierra View became their home church. Dawn and I also have a strong connection with Sierra View, since my family lives in Fresno. So we have some things in common with the Calls. We both have served with Campus Crusade for Christ, we have the Fresno and Sierra View connection, and now we will be working together on the border. One difference is that Ray and Michele have six children, so they’ve got us beat there. 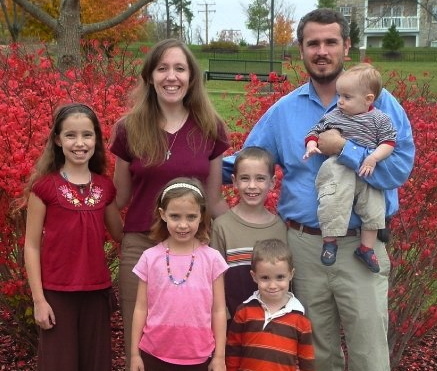 Their children are Rebecca, age 13; Jeremiah, age 11; AnnaGrace, age 10; John, age 6; Daniel, age 4; Christina, age 1. The Calls have served with Mission to the World since 2006. They spent two years in Mexicali. We are looking forward to ministering side by side with them to see the gospel go forth, with the hope that many will come to faith, lives will be transformed by the gospel, and many churches will be planted. 1. They are moving from Mexicali to Bonita this upcoming week. It’s about a two hour drive, but the main challenge is bringing things back into the U.S. Pray for a smooth move. 2. Pray that their family will adjust quickly to their new surroundings. 3. The cost of living is higher in the Chula Vista region, so pray that the Lord will provide the additional financial support that they need. 4. Dawn and I will be with in Chula Vista from June 3 – 14, pray that we are able to have some good opportunities to meet with, and get to know Ray and Michele. Pray that we build a strong foundation for our team. 5. Dawn and I would like to be an encouragement to them. Pray for wisdom, that we will be sensitive to the Lord’s leading as we seek to minister to them. 6. We are thrilled with this answer to prayer (the Calls joining the team)! Pray for more team members. We are still praying for the Lord to make the way and the steps clear for Mario & Silvia Silva.